No tips for horn honking cab drivers. No tips for horn honkers! New York City is full of energy. But, the down side is there's lots of noise and distractions. 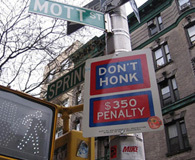 A major contributor is car horns,most often honked by taxi drivers. 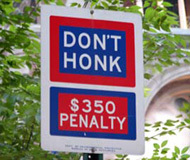 The city has posted the warnings shown above and recently, they have vowed to crack down on honks and issue more fines. But, its not working. "Good morning, 5th Avenue at 59th Street, please. If you honk the horn for any non-emergency, you will forfeit any tip." Or by handing the driver a card as shown below. The cards can be sized to fit in one's purse or wallet - business card, credit card, or dollar bill. The cards are a more effective way for the rider to get the point across without seeming as confrontational. The bright cards might have a longer shelf life and would help push the campaign along. The notices for the drivers should be easy to store and carry, convenient to access, and convey a clear persuasive message. The plan hits the drivers exactly where it can have the most impact. It shouldn't take long before a cab driver is motivated to change his honkin habits. Once a critical mass of people use this threat, the drivers couldn't be sure which entering fares will cooperate. The yellow and the band of checks convey the connection to taxicabs and the font and upper case is as is used for TAXI on the vehicles.